Dermis and epidermis are basically protective outer layers of the body. The main difference between dermis and epidermis is that dermis is a tissue below the epidermis, containing living cells whereas epidermis is the outermost part of the body, protecting it from dehydration, trauma, and infections. The dermis of animals is found in the skin and is made up of dense irregular connective tissue. The epidermis of animals is made up of stratified layers of flattened cells. Dermis is vascular while epidermis lacks blood vessels. Plants also contain an epidermis. The epidermis of plants contains closely-packed cells with a waxy cuticle, preventing the water loss. Dermis refers to the thick layer of living cells below the epidermis, which contains blood vessels, nerve endings, sweat glands, and hair follicles. It provides extensibility, strength, and firmness to the skin. Dermis helps the diffusion of oxygen and nutrients to the epidermis. It also contains antibodies to fight against pathogens. It is capable of initiating inflammation during skin injury as well. 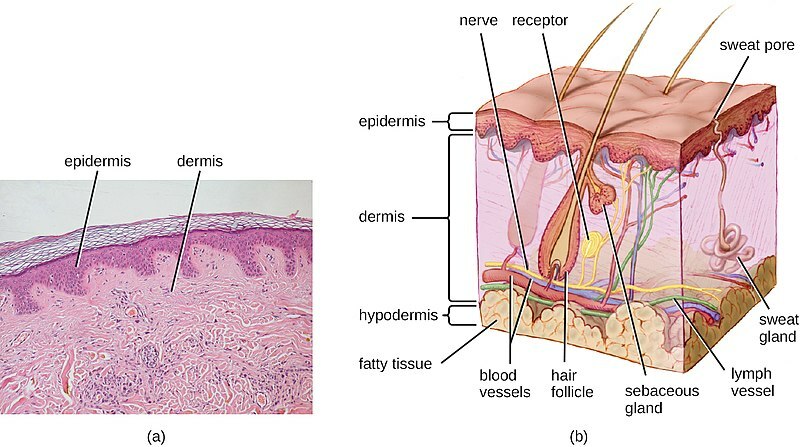 The layers of the skin are shown in figure 1. The two layers of the dermis are papillary dermis and reticular dermis. Papillary dermis is a thin layer found just below the epidermis. It is made up of loose connective tissue. Papillary dermis contains collagen fibers, elastin fibers, reticular fibers, and capillaries. The deeper and thicker layer of the dermis is the reticular dermis, which is made up of dense connective tissue. It contains collagen fibers, elastin fibers, blood vessels, lymphatic vessels, nerve endings, fibroblasts, and macrophages. The extracellular matrix of the dermis comprises chondroitin sulfates, mucopolysaccharides, and glycoproteins. Epidermis refers to the outer layer of cells, which cover the body of an organism. It is visible to the eye and the main function of the epidermis is to protect the internal structures of the body from dehydration, trauma, and infections. Epidermis is responsible for the renewal of cells in the skin. Since epidermis lacks blood vessels it obtains nutrients and oxygen by diffusion from the dermis. Based on the maturation of the cells in the epidermis, four or five cell layers can be identified: stratum corneum, stratum lucidum, stratum granulosum, stratum spinosum, and stratum germinativum. Stratum germinativum is the innermost layer of the epidermis, adjoining it to the dermis. The outermost layer is the stratum corneum, which prevents water loss. Palm of the hands and sole of the feet contain a thick epidermal layer. 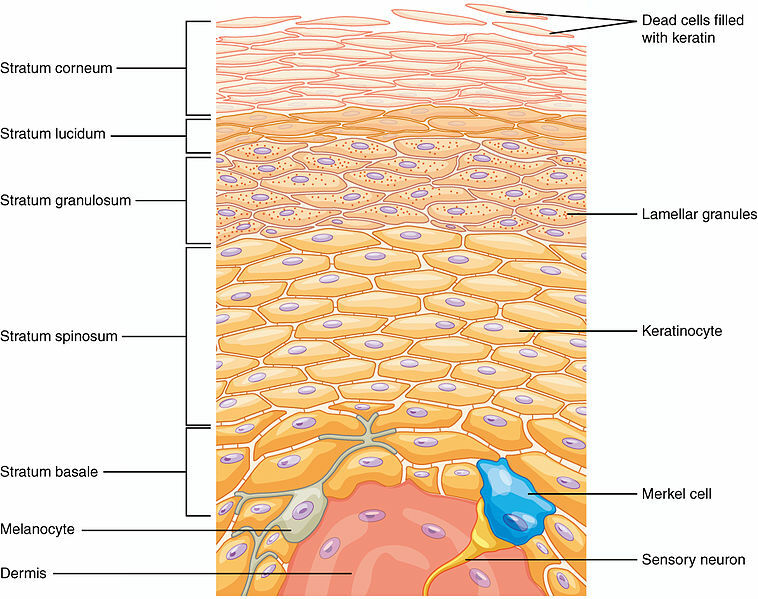 The layers of the epidermis are shown in figure 2. Keratinocytes, melanocytes, Langerhans cells, and Merkel cells are the four type of cells in the epidermis. Keratinocytes are the most common type of cells in the epidermis, producing keratin. 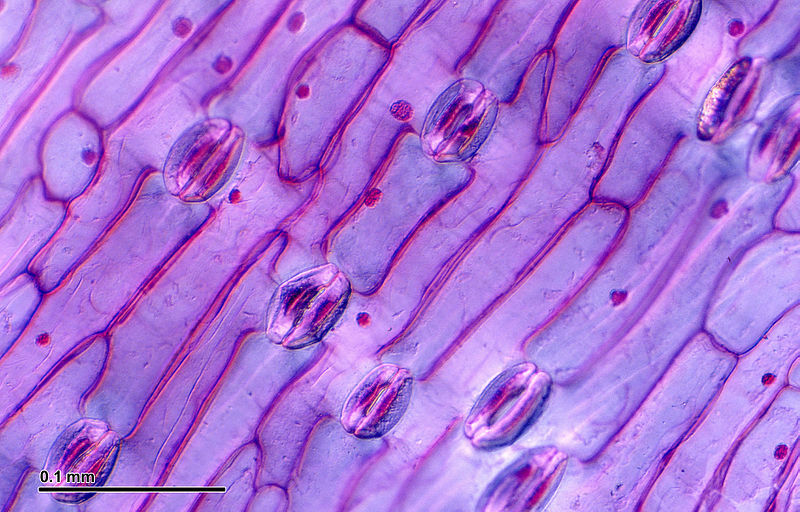 These cells are originated from the stratum germinativum and gradually move to the outside layers of the epidermis. Old keratinocytes are shed from the skin, replacing them with new cells. Melanocytes are found in the basal layer of the epidermis. They produce melanin, contributing to the color of the skin. Melanin prevents DNA damage in the skin cells by UV. Langerhans cells protect the skin from infections. Merkel cells originate from the neural crest and are present in nail beds and gentalia of the skin. They are responsible for the perception of gentle touch. Plants also have an epidermis, covering the leaves, stem as well as the root of the plant. Plant epidermis is mainly composed of epidermal cells, guard cells, and trichomes. Epidermal cells can be either polygonal or elongated in the top view. They mostly occur in a single layer. They secrete a cuticle layer on the top of the epidermal cells, which prevents water loss. Epidermal cells lack chloroplasts. The leaf epidermis is shown in figure 3. Two guard cells maintain the size of stoma through which the gas exchange occurs in plants. Trichomes are the epidermal attachments of the plant epidermis, protecting and supporting the leaf and absorbing water in the root. Both dermis and epidermis are outer protective layers of the body of animals. Both dermis and epidermis are components of the animal skin. Dermis: Dermis refers to a thick layer of living cells below the epidermis, which contains blood vessels, nerve endings, sweat glands, and hair follicles. Epidermis: Epidermis refers to the outer layer of cells, which cover the body of an organism. Dermis: Dermis is found below the epidermis. Epidermis: Epidermis is the outermost layer of the body. Dermis: Dermis is the thickest layer of the skin. Epidermis: Epidermis is a thin cell layer. Dermis: Dermis originates from the mesoderm. Epidermis: Epidermis originates from the ectoderm. Dermis: Dermis is only found in animals. Epidermis: Epidermis is found in both plants and animals. Dermis: Dermis is made up of dense irregular connective tissue. Epidermis: Epidermis is made up of stratified layers of flattened epithelial cells. Dermis: Dermis contains an extracellular matrix. Epidermis: Epidermis contains tightly-packed cells without an extracellular matrix. Dermis: Dermis consists of blood vessels. Epidermis: Epidermis lacks blood vessels. Dermis: Dermis obtains oxygen and nutrients from blood capillaries. Epidermis: Epidermis obtains oxygen and nutrients by diffusion from the dermis. Dermis: Dermis contains sensory nerve endings. Dermis: Dermis consists of hair follicles, nails, feathers, sebaceous glands, sweat glands, apocrine glands, and lymphatic vessels. Epidermis: Epidermal cells consists of keratin and suberin in animals and plants respectively. Dermis: Dermis contains fibroblasts, adipocytes, and macrophages. Epidermis: Epidermis contains melanocytes, keratinocytes, langerhans cells, and merkels cells. Dermis: Dermis is made up of entirely living cells. Epidermis: Epidermis is made up of both living and non-living cells. Dermis: Dermis provides extensibility, strength, and firmness to the skin. Epidermis: Epidermis protects the body from dehydration, trauma, and infections. Dermis and epidermis are two outer layers of the animal body. Epidermis is the outermost layer, which protects the internal structures of the body. Dermis is found below the epidermis. It contains blood vessels and nerve ends. The main difference between dermis and epidermis is the structure and function of each type of structure in the body. 1. Smith, Yolanda. “What is the Dermis?” News-Medical.net, 3 Aug. 2017, Available here. 2. Smith, Yolanda. “What is the Epidermis?” News-Medical.net, 29 Nov. 2016, Available here.